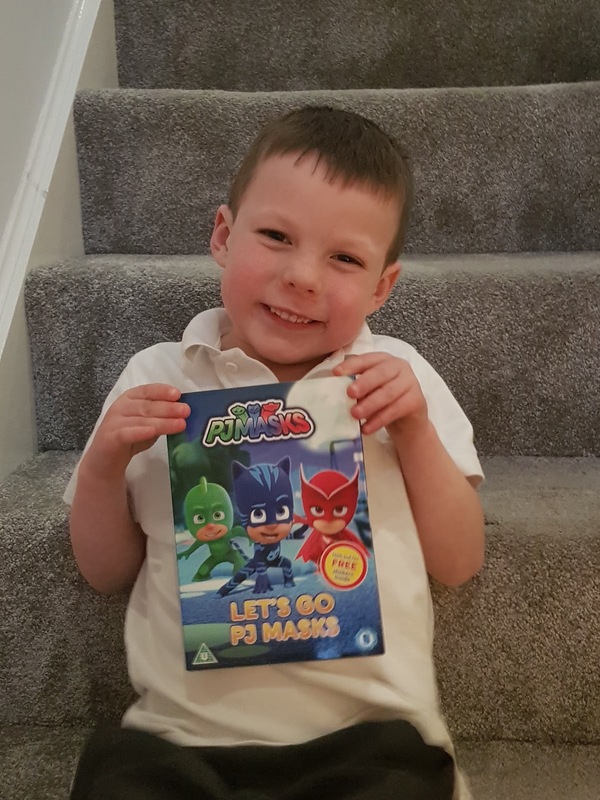 We love PJ Masks in our house. If you have no idea who or what I'm going on about PJ Masks are a heroic trio who are normal children by day and then transform into super heroes at night. Comprised of Catboy, Owlette and Gekko together they go on adventures, solve mysteries, defeat criminals as well as learning valuable lessons along the way. Alfie was delighted to be sent a copy of the brand new PJ Masks DVD which is available from Monday 5th February. 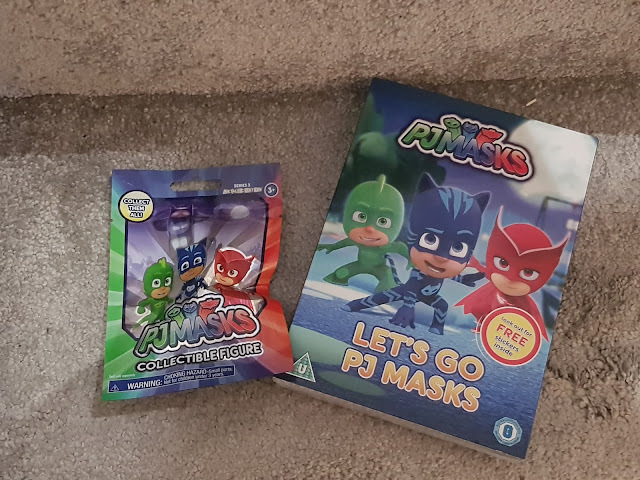 We had a great time watching the 6 episodes on it and I'm delighted to say if you're a fan of PJ Masks I have a copy of the DVD to giveaway. Gekko and the Snore-A-Sauras - Luna Girl turns a sleep walking Cameron into her very own human puppet, it's then up to PJ Masks to save the day however Gekko has to stop messing about first! Catboy and the Shrinker - Romeo and Night Ninja join forces to shrink the PJ Masks with Romeo's shrinker invention. When Catboy gets shrunk he forgets that even a little guy can save the day.....of course using his small size to his advantage. Blame it on the Train. Owlette - When the new Fairground Flyer Train goes missing from the fair Owlette is determined to get it back asap. However, if she wants to defeat Romeo's new super train she will need to learn that a little patience goes a long way. Looking after Gekko - When Night Ninja steals the new school bus and converts it into his very own super vehicle it's up to our heroes to stop him in his tracks. But for that to happen Gekko needs to learn that asking for help doesn't make you weak. Catboy's Tricky Ticket - Catboy only has two tickets to the Jayden Houston concernt and has to decide which of his best friends to take to the show. Owlette and Gekko offer himn presents to sway his decision and Catboy's new found greed could ensure Luna Girl ruins the concert for good. Clumsy Catboy - Romeo plans to use his newest device to make everyone in the world so clumsy that they can't stop him from taking over the world. But when Catboy is the first to be 'clumsified' he can't admit it and tries to save the day without any help. We really enjoy watching PJ Masks, it's alot of fun and this DVD has a run time of 72 minutes so ideal for watching all in one go or just dipping into for an episode here and there. Available from Amazon for £7.99 or for digital download from tomorrow! Head over and check it out. To be in the chance to win yourself a copy (I have 1 to giveway) entry is via the Rafflecopter below. UK entries only please and do leave a valid email address and Twitter handle so I can contact you if you win. The DVD will be sent directly from the company so I am not responsible for this once the competition has ended. Please follow the instructions on the Rafflecopter with how to enter......good luck! My son loves Catboy as he is the leader and he can hear the quietest sounds across unbelievable distances! It would have to be night ninja as who doesn't love a ninja and my niece finds them funny too. I asked my son Oliver who is his favourite PJ Mask. He said Catboy as he is so fast! Owlette is our favourite because she's quick-thinking and organised! Owlette because she's a girl. Image de Dragon Ball Super avec Trunks et Mai. My little nephew loves Catboy. The Tubblet is too old for such things now but good luck everyone! My little one likes gecko. She too likes to climb. My son loves Catboy, he got the costume for Christmas and has barely taken it off! I've been made to sit down and watch a couple of episodes and they are quite fun. Great giveaway. My son loves catboy as hes the best he tells me. My son likes cat boy because of his quick moves and cat like hearing. Catboy is Maxx's favourite. He even had a PJ Masks birthday party and dressed up as CatBoy.